We have launched a new necklace especially for Valentine’s Day and other romantic occasions. The disc is engraved with our beautiful mandala design, and we have added a tiny gold heart to hang alongside it. It represents the mantra, ‘You fill my life with love’. Perfect mantra to show her how much she means to you | to celebrate the power of love and connection | and a meaningful Valentine gift. 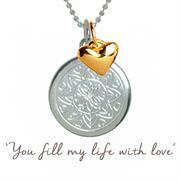 The mantra conveys a powerful message to your loved one, of the impact they have on you. They fill your life with love, by being with you. This is a romantic mantra that brings comfort, happiness, reassurance and joy, and celebrates your happiness. If you receive this necklace from a loved one – it communicates a romantic and lasting message of their appreciation of your love for them. When you wear it, hold onto it to reassure you of your close connection with your partner. Know that love surrounds you and your partner, and their life is made better by your love. The design is a mandala, which is a symbol of the wholeness of the universe. A symmetrical design made up of orderly shapes and patterns, a mandala symbolises harmony and unity. Each one is unique, and can be seen as a spiritual tool, or a beautiful piece of art. 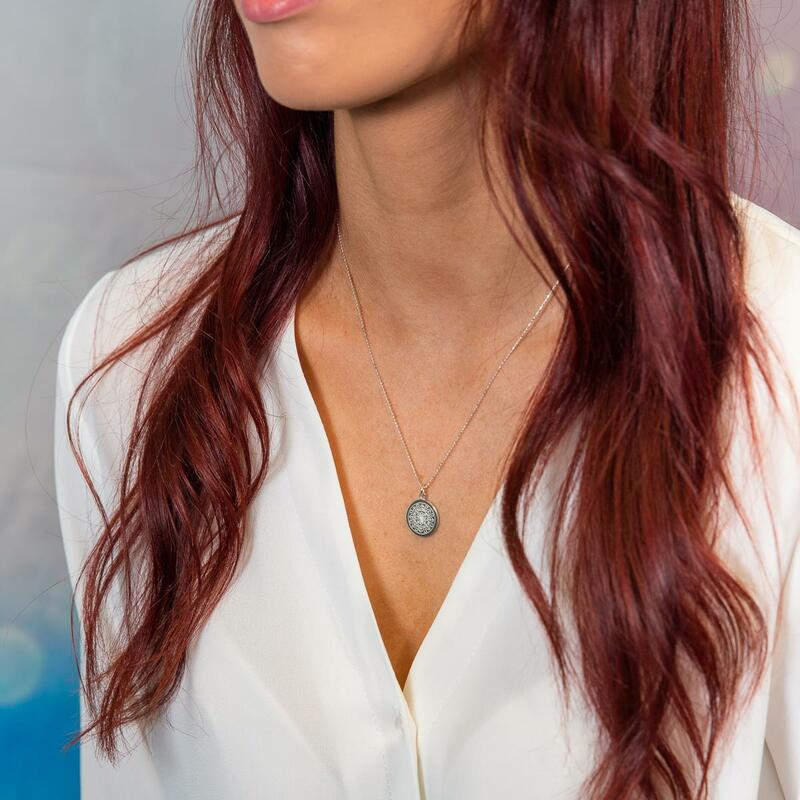 The mandala we have created at Mantra Jewellery weaves hearts around the central lotus symbol, showing the love that connects us all. We have added a small 18ct Gold-plated Heart, to make it even more special as a Valentine’s gift. Hold onto your piece of jewellery from time to time through the day, and bring to mind its mantra. Mantras work to uplift us when we feel down; and serve as both celebration and appreciation when we are happy and content. This is one of our personalised necklaces. FREE ENGRAVING for Valentine’s Day. Your message can be engraved on the reverse of the pendant.